In the August issue of Hardware Retailing, we spoke to three retailers who have excelled in the camping niche. To dig deeper into the niche, we spoke to Cliff Jacobson, an outdoor adventure writer and wilderness guide, for insights on what camping customers need. According to Jacobson, his interest in canoeing and camping began when he was just eight years old. After years of experience in the outdoors and reading books by others on the subject, he found that these resources offered inaccurate information. That’s when he decided to share his insights with others. “The procedures I recommend in my books are based upon years of experience, canoeing and camping in some of the most remote parts of North America and the continent,” he says. Hardware Retailing spoke to Jacobson for tips on how retailers can educate themselves and offer the best products for wilderness campers shopping in their sporting goods department. Hardware Retailing (HR): What items do you bring on an outdoor adventure trip? 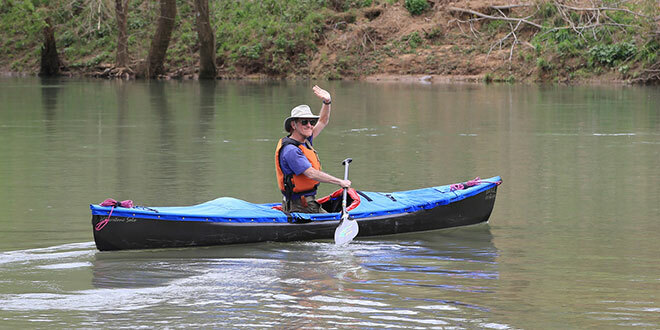 Cliff Jacobson (CJ): There’s an “equipment list” in the back of my flagship book, “Canoeing Wild Rivers.” My trips are frequently in places where help is an airplane ride away. If bad stuff happens there, you’d best be prepared with the right gear, and more importantly, know what you’re doing. What you need for car camping is largely different than what’s needed for wilderness camping. But if you choose gear for the worst wilderness scenario, you’ll be beautifully prepared for the worst situation you might encounter in non-threatening car camping. HR: What should someone know if they’ve never been camping? What is important when setting up a camp? People tend to think that camping and paddling are easy: all you need are a few basic items and a change of clothes and you’re good to go. However, if the weather deteriorates to an unsafe degree or a canoe capsizes, things change instantly and suddenly good enough becomes inadequate. If your idea of camping is strictly car camping, fine. But if you’re going in harms way, you’d better learn some skills—fire-making in the rain, stormproofing your camp, navigating with map and compass, cooking in high wind and rain and proper packing to discourage animals. HR: What brands do you look for when stocking up on camping gear? CJ: In canoes, my favorite brands are Northstar Canoes and We-no-nah Canoe. I largely prefer European tents like those made by Hilleberg. In the U.S., Eureka makes some very good tents at reasonable prices—I think they are probably the best U.S. tents for the price. I think North Face, Mountain Hardwear and a few other companies make some fine tents if you know what to look for. Perhaps the two top brands I would pick are Patagonia and Arc’teryx. Both companies make excellent outdoor clothing, though admittedly, I don’t own any of their stuff, largely because I just can’t afford them and my skills are good enough to overcome the very slight disadvantage of lesser built, lower priced gear. In my opinion, skills are more important than things. HR: Would you say more people are returning to outdoor adventures and camping trips? CJ: Recent studies show there is a human connection to wild places, and that when denied them, our brains don’t develop correctly. We’re seeing this in teenagers who never go outside. It’s almost impossible these days to get a campsite at a popular national park unless you book it months in advance. But with the right skills, and a modicum of well-chosen gear, one can experience beauty and real isolation in a state forest or a river bank near their home. Equipment today is lighter, more compact and easier to use than many decades ago, so it’s easier for people to camp and paddle than it used to be. Add to that the fact that guides and maps and suggestions of where to go camping, are available online. You can arrange a paddle or camping trip anywhere in the world without leaving your computer. HR: When you go into a retail location to buy equipment, what are you most concerned about? CJ: You want a successful store that draws people in? Then you need unique products and knowledgeable employees. Remove cheap knives and replace them with quality knives. Get rid of low quality axes and carry Gransfors Bruk axes. Invest in knowledge—consult with outdoors experts who will advise top products you should carry; and yes, sell outdoors books that tell how to do things right in the outdoors. Most stores are removing books from inventory largely because a $200 parka can be hung in the same place as three $20 books. However, books teach people how to do things right. They suggest how to find quality gear and what to look for. By offering this knowledge, your store becomes more than just a place to buy things but a place to learn. Piragis Northwoods Co. in Ely, Minnesota, has a full room filled with books. The company is the most profitable outdoor store in Ely. They sell $500 knives and $200 axes, and these products move off the shelves. HR: How do you think a retailer could set themselves apart from big sporting goods chains? CJ: Accomplished wilderness travelers go to stores like Midwest Mountaineering in Minneapolis, Piragis Northwoods Company and similar stores that have high-quality gear and a wilderness-knowledgeable sales staff. And of course, a lot of top stuff is sold online, but if a store can be competitive with online pricing, most outdoors people I know would prefer to buy from the store—largely because you can inspect and fit what you’re getting. HR: Is there anything else you’d like to share with our readers about camping or outdoor adventures? CJ: Learn first, buy second. Skills are more important than things. If you are hitting rocks with your canoe, you don’t need a better canoe: you need to learn how to paddle! If your tent leaks in a storm, learn how to stormproof it. My books will show you how. You will not solve problems by buying things, you will only solve them with knowledge. If you know the proper techniques and methods for camping, you can get by with pretty simple gear. If you don’t know these things, you’ll be handicapped even if you have the best stuff on the market.